Terrain (and a few other things)! Making and painting terrain has kept me pretty busy recently. I decided I needed to make an effort to get some of the 'basic stuff' done. For the past year I've been playing at the Friday Night Fire Fire Club where there is ample terrain provided. I've therefore been a bit lazy getting my own projects finished. Well, no more! Counting up all of the terrain completed this year is tricky so I'll list it all out... 5 small woods, 3 medium woods, 1 rocky ground, GW Walls/fence kit (~10 items), 2 ploughed fields, 1 cave, 6 moorland outcrops, 15 unpaved road sections, 8 river sections, wooden bridge, stone bridge, 12 telegraph poles, Sontaran spaceship, communication module, transmat circle, 20 straight hedge sections and finally 10 moorland tokens. Yes I've been busy with terrain this year! Here's some of it in use today during a game of SAGA. The advantage of doing it like this is that the rocks can be moved when figures are placed. The woodland has all been done the same way. Another advantage is that by using different tokens the terrain can double as something else. I have tokens with no rocks to make basic uneven ground and tokens with cut stumps and log piles to get the same effect with the woodland bases. A while back I posted some wip livestock. Well these are all now completed as well. Some are mounted on 40 mm bases to be used as baggage in SAGA. Others are mounted on 25 mm bases (aka 2p coins...) to be used as scenic elements, or general objective markers. It's been a while since I posted an update, but yes I'm still here and busy with lots of new projects. At the moment these are mainly terrain and seem to be taking up most of my free hobby time. Anyway, updates on these projects will follow soon(ish). 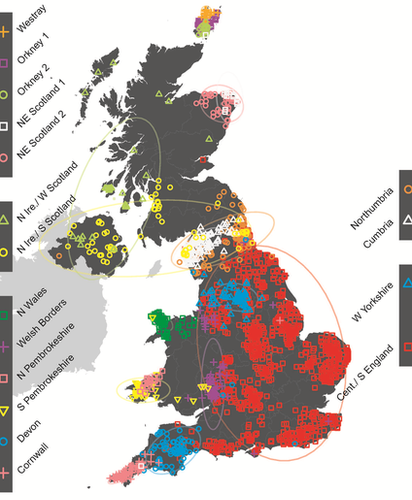 In the meantime I thought folks may be interested in this recent DNA study of people living in the United Kingdon (for those of you from distant lands that's Northern Ireland, Scotland, Wales and England). My own family originate from County Cavan in Eire so sadly are not included in the study. I'm guessing that folks from Cavan would have a similar genetic make-up to those from Northern Ireland, but given the remarkable difference between populations from North and South Wales who knows? !